The underlying theory behind the diet is that the body has a ‘set point’ which is the weight that it naturally endeavors to maintain. The basis of Roberts’ approach is that the ‘set point’ can be reduced to a lower weight by consuming small quantities of plain olive oil and sugared water in between meals. Roberts also adds to his theories about dieting by suggesting that the body learns to associate high flavor foods with calories and this drives us to overeat our favorite foods. By consuming a diet composed of only bland, tasteless or unfamiliar foods, in addition to the oil and sugar water between meals, he claims that it is possible to reduce the appetite and caloric intake which subsequently will produce weight loss. There are no real guidelines to the diet and the only requirement is that dieters include approximately 300 calories in the form of either light olive oil or sugar water which is taken in between meals. Roberts proposes that as long as you add the oil and sugar water to your diet you don’t have to worry about what you eat because you won’t have much of an appetite. He says that this means that it will make it easier to choose healthy foods, and even if you choose higher calorie foods you won’t eat as much of them. Roberts stresses an individualized approach because all of us have a unique set point and does not offer any specific advice for planning meals. 1-4 tablespoons of light olive oil are consumed during the day in addition to sugar water as required. Bland and tasteless foods form the foundation of the diet such as mashed vegetables and blended foods. Nose clipping is advised as a method to reduce the taste of other more tasty foods and is regarded as a way to gain ‘credit’ for eating bland tasting food. No other foods are specifically recommended other than fruit as snacks although Roberts does mention the importance of low glycemic index foods. There are no meal suggestions or menu plan. As an example The Shangri-La Diet’s personal maintenance plan is composed of one normal meal which contains approximately 900 calories, as well as 150 calories of sugar water between food and 2 pieces of fruit per day. His total daily calorie intake is 1200 calories. Look for healthy low Calorie meal ideas here. The Shangri-La Diet retails for $19.95. The only other expenses are olive oil and sugar. No forbidden foods. No calorie counting. Appeals to those who don’t want to or are unable to exercise. Inexpensive compared to most other diet plans. Consuming plain oil may be difficult for some people (although it is possible to use sugar water instead if preferred). Eating only bland tasteless foods is not very appealing or enjoyable. Nose clipping may create social difficulties. May be difficult to maintain weight loss when consumption of foods with flavor is resumed. Doesn’t address psychological factors involved in weight management. Experimental evidence for diet based largely on self-experimentation by Roberts and several others. Criticized by other experts on nutritional biochemistry. Although the oil may actually reduce appetite Roberts is probably stretching his theories too far with lack of real scientific evidence for his claims. It seems highly likely that having 3 small 100 calorie snacks daily in between meals could produce similar effects on appetite control. When considered from this perspective the Shangri-La diet does not seem to differ from many standard diets that recommend three meals with three small snacks. Nonetheless many people have reported favorable results on this diet and Roberts has many supporters although it appears that there are an equal number of dieters who don’t do well with his approach. 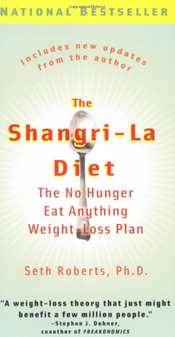 The Shangri-La Diet’s failure to address lifestyle factors such as exercise and psychological reasons why people gain weight weakens his arguments and most people will probably not find the idea of a lifetime of eating bland tasteless foods very appealing. A while back, I was listening to “talk radio” in my car and heard Dennis Prager say that olive oil helps to suppress appetite, leading to loss of excess weight. I only caught the tail end of it, and let it go. Evelyn Tribole, M.S., R.D., brought to my attention recently a scientific article regarding hunger suppression by fatty foods, such as olive oil. I found the time to research Prager’s statement. The olive oil/appetite suppression link seems to emanate from Seth Roberts, Ph.D., who was (and still is?) a psychology professor at the University of California – Berkeley. He self-experimented with the theory that sugar water or olive oil taken on an empty stomach suppresses appetite naturally. He stumbled upon his theory on a trip to France when he noticed that soft drinks unfamiliar to him seemed to suppress his appetite. His theoretical underpinnings are based on rat studies, and on the idea – not his own – that our bodies have a weight set-point that mostly determines our weight. The set-point is like a thermostat that can be reset. Set-point theory explains that after a spell of weight loss, we usually return to our previous heavy weight because that’s where the thermostat (set-point) is set. We need to reset the thermostat. How do you do that? Drink either 1) one tbsp of extra light olive oil, or 2) one or two tbsp of fructose or sucrose (table sugar) in water, and do this not at mealtimes but at least one hour after meals, one to four times daily. Don’t eat anything else at the time of the supplement, nor for one hour thereafter. Total calorie content of these supplements is 100-400 calories per day. You experiment to find the dose that suppresses your appetite. And eat healthy meals of your choice. Dr. Roberts says the extra light olive oil is better than the sugar. Not extra virgin olive oil, which has too much flavor. The pure, unadulterated sweetness of sugar, and the near-tastelessness of the olive oil are important, according to Dr. Roberts. They trick your weight set-point into resetting. At least this is the theoretical framework he gave to Prager and TheDietChannel.com in 2006. ABC News in 2005 reported he “suggests it works by suppressing a basic ‘caveman’ instinct from days when access to food was intermittent. The diet tricks the body from thinking it needs to eat every last bit of food before an impending famine.” My sense is: If it works, it works, and the underlying mechanism is less important. Dr. Roberts easily lost 50 pounds with his method and wrote The Shangri-La Diet: The No Hunger Eat Anything Weight-Loss Plan to share with the world. The blogosphere and the authors of Freakonomics helped spread the word rapidly. In 2006, Dennis Prager allocated an entire hour of his show to Dr. Roberts, and volunteered that the olive oil indeed was suppressing his (Prager’s) appetite. According to the book reviewers at Amazon.com, the Shangri-La Diet clearly works miraculously well for some, not at all for others. You can find much more information and testimonials at http://www.sethroberts.net., perhaps enough that you don’t need to purchase the book if you want to give it a go. Last I checked, the paperback was $3.99 plus shipping at Amazon.com. I’m not sure if this diet is a hoax or not. It’s possible it is a social psychology experiment. Maybe Dr. Roberts had a bet with someone that “anyone can write a popular diet book if they just use the formula.” You can find the formula at http://www.sethroberts.net under “Reviews and Media.” Listen to Dr. Roberts’ interview with Dennis Prager and decide for yourself. He sounds earnest. I suspect it’s a hoax but, then again, Dr. Roberts may himself be a true believer. What’s the evidence for hoaxiness? The subtitle was my first clue: The No Hunger Eat Anything Weight-Loss Plan. Legitimate, scrupulous doctors would be embarrassed to use that phrase. The second clue is that Dr. Roberts seems to be a former contributor to Spy magazine. This is precisely the sort of hoax the editors of Spy would concoct. The third clue is that he uses just enough quasi-legitimate scientific theory and jargon to rope in many readers. I was particularly interested in the olive oil aspect of the Shangri-La Diet since olive oil is the predominant form of fat in the traditional healthy Mediterranean diet. I searched PubMed.gov for scientific clinical studies in overweight humans showing that olive oil suppresses appetite and leads to weight loss. I found none as of October 12, 2008. Note that extra light olive oil is refined oil and has less of the healthy phytonutrients found in extra virgin olive oil. Dr. Roberts’ program, and its apparent success in some users, exemplifies the idea that losing excess weight is, in part, a matter of trial and error. For example, the Atkins diet may work great for you, but not your next-door neighbor, who lost with Shangri-La, which didn’t work for your mother-in-law. To some extent, weight-loss efforts are “an experiment of one.” What works for you is partially based on genetics (idiosyncratic metabolic processes), personal preferences, early childhood experiences, financial resources, preparedness for change, personality type, etc. However, two themes unify most people who have lost a significant amount of weight and kept it off long-term: 1) they don’t eat as much as in the past, and 2) they exercise more. Look for these when you search for effective weight-loss programs. The aforementioned article brought to my attention by Evelyn Tribole suggests how olive oil and other unsaturated fats could curb hunger. Oleic acid, a prominent monounsaturated fatty acid in olive oil, is transformed into oleoylethanolamide (OEA) in the small intestine. OEA then activates a brain circuit that gives you a feeling of fullness, reducing appetite, and potentially promoting weight loss. A 2007 article in the Journal of Molecular Medicine exposes a genetic variation that seems to prevent high fat consumption from contributing to overweight. Read about it at FuturePundit.com. The gene variant may be found in 10-15% of the U.S. population. Consumption of monounsaturated fats, as in olive and canola oil, almost seems to protect against overweight in people who carry this genetic variation. I’m talking about single nucleotide polymorphisms of the apolipoprotein A5 gene, specifically, -1131T>C. But you knew that, right? Nutritional genomics may eventually allow us to customize our food intake to work best with our personal genetic make-up. A number of people, including Dr. Roberts, swear by the Shangri-La Diet. It works for them. I don’t think most of them are lying. Maybe they are in the subset of the population with the appropriate genetic variant. It would be easy to design and execute an experiment on 100 subjects to test the efficacy of the Shangri-La Diet. Until that’s done – and it probably never will be – you could inexpensively try the Shangri-La “experiment of one” on yourself. From what I’ve read, you’ll know within the first week if you achieve the natural appetite suppression that substitutes for the willpower and discipline required by effective diets. As always, get your personal physician’s OK first. If it is a hoax, I complement Dr. Roberts on his ingenuity. His book was a bestseller in 2006. For those he may have duped, it didn’t cost them much and probably caused no harm. Corella, Dolores, et al. APOA5 gene variation modulates the effects of dietary fat intake on body mass index and obesity risk in the Framingham Heart Study. Journal of Molecular Medicine, 85 (2007): 119-128.